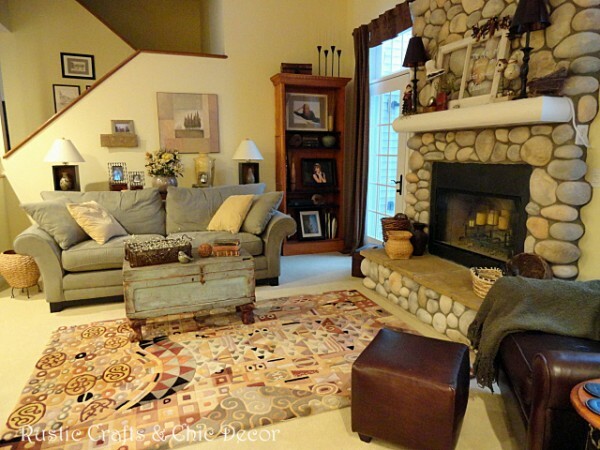 Have you ever thought about the meaning of colors when you pick your palette for decorating? The colors that you choose can actually affect the way you feel. I tend to naturally be drawn to the color yellow and have chosen a light buttery shade as the main wall color throughout my house. When I looked up the meaning of the color yellow, I discovered that decorating with yellow is actually a pretty good idea. Not only is it pleasing to the eye but it has other benefits as well. Yellow is supposed to bring about energy. I’m guessing the truer the yellow, the more energy it evokes. However, even a light shade will give off the affect of a sunny day. It gives clarity for decision making, relief from stress, sharper concentration skills, and alleviates depression on a cloudy day. Bring on the yellow I say! 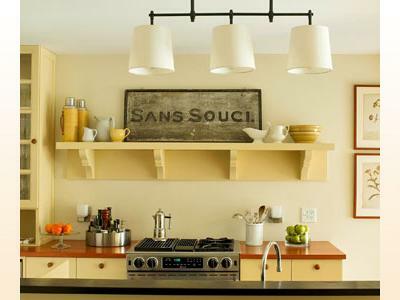 You can also add some yellow with your decor in the form of furnishings, throw pillows, and other accents. 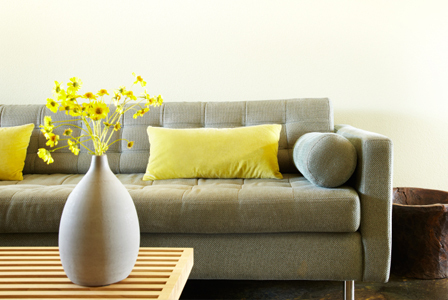 Here are some examples for adding a touch of happiness into your home with the color yellow. I feel energized just looking at the photo of this sunny living room. What a great place to go and de-stress especially on a cold winter day! A softer yellow is more soothing than energizing. However, both shades have their advantages. 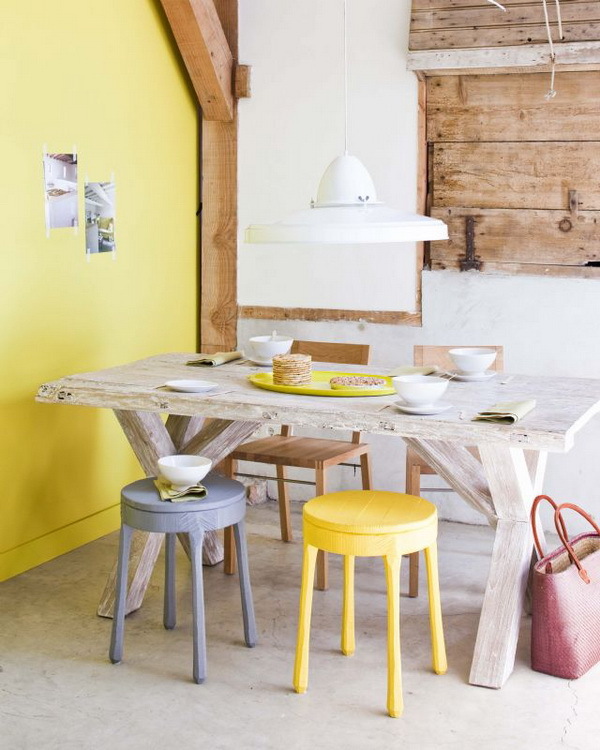 I could sit in this yellow dining room all day long. But, then I would probably feel like eating all day too which could be a problem! It would be a great to dine in such a cheery spot though. A little splash of color even looks appropriate in a rustic setting like this. The yellow really brightens up the darker wood. A kitchen done in yellow would be just as wonderful. The soft yellow is a perfect match with the stainless steel. 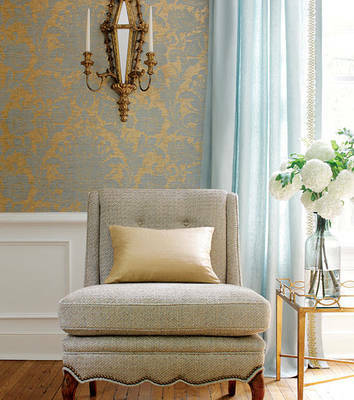 If a whole lot of yellow is not really your thing, you could always add just a touch for accent. You can see that the small touches of soft yellow warm up the cool blue just perfectly. The yellow throw pillows and flowers add a nice pop of color to the otherwise neutral color palette while at the same time bringing a little sunshine in. A little more yellow is used in this cheery bedroom. 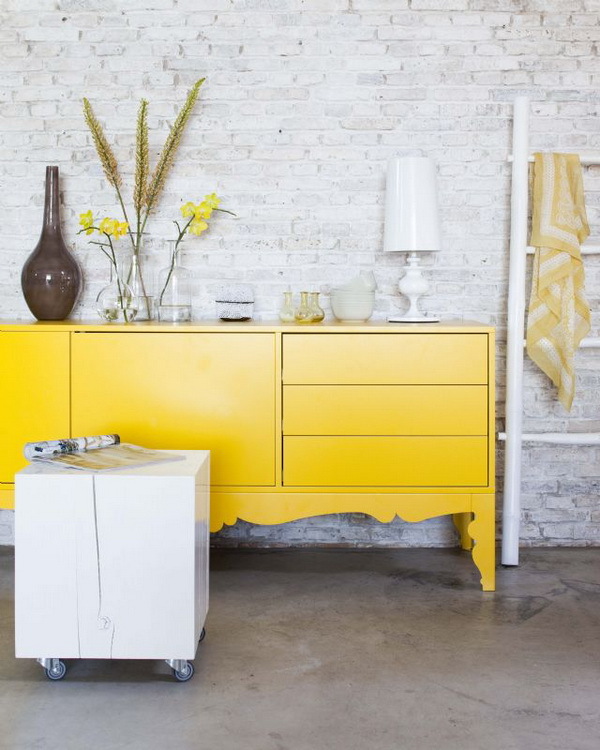 Bright yellow furniture can be a wonderful accent to the norm. I love how it pops against this brick wall. Hanging a scarf from a ladder, with shades of yellow on it, is another awesome idea. Have you considered decorating with yellow? In what ways have you added the color? Yellow coloured interiors are a favourite among many and in this post, it will bring you some outstanding yellow themed for your rooms. I just love your site. Fantastic ideas. I wanted to know what color paint you used in your living room. I really love that color! Thanks! Thank you! The color I used was Benjamin Moore’s weston flax. Always have loved yellow. Recently redecorated a spare bedroom with pale yellow, a soft aqua and chocolate brown. Love it! Also enjoy your site . Thanks. That sounds like a great color combination! Thanks for stopping by! Wow! 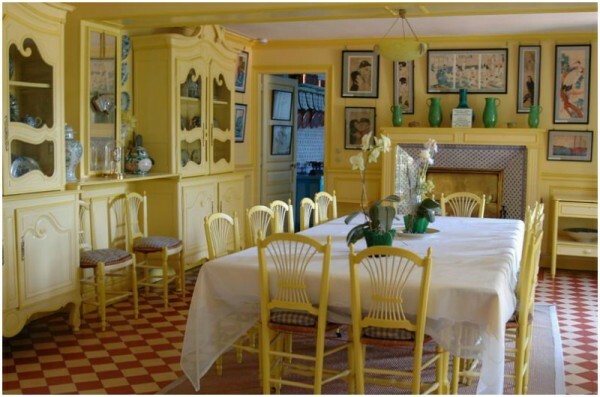 I love the all-yellow dining room with red and white checkered flooring. I hate yellow as dominant color in any room, but with what I’ve seen here in your post. I might considered it the next time I redecorate one of my rooms. Haha….I’m glad I could change your mind a little about yellow :). It is a pretty uplifting color.